well, it's halloween time. it had also been the day to dress up for prizes and what not at work. used to be one of my favorite holidays, but the last few years haven't really had the time or money to think about a costume. being that i've been at home sick, i've had plenty of time to consider things, but no energy to put something new together. so i dug into my box of old costumes. one thing about being sick is that you have no appetite, so i've lost a few pounds, though not enough to get back to what i used to be. anyway, i got back into an old leopard costume i'd worn in high school, though i filled it out a bit more than i used to, it was still doable. went to work, where at first i didn't see anyone else dressed up. for some reason, they like to keep their costumes a secret until the competition begins, so i was the only one for a while. people were having a difficult time talking serious business with me, while looking at my cat face paint job. that was pretty funny. no, i didn't win anything, mostly because i'm too shy to walk across the stage and strut about fabulously, so i didn't enter anyway. but lots of people liked that i had the nerve to dress up. i drove straight to the ruby's show after work. it was the last show for the year, so i expected it would be very busy. i was not disappointed. lots of cars. at first i didn't see too many people dressed up, though it had been announced at previous shows that there would be prizes for costumes and decorations. took a bit of nerve for me to get out of my car, but i said screw it, and went about my business. yes i did get stared at, and i really had to ignore that or i'd just turn around and leave. funny how juvenile some of the guys are – one guy pretended he couldn't read something on the hood of a car, wanting me to bend over for a closer look. nah, didn't give him the satisfaction, but he did have the balls to try asking me again, even after i told him from where i was what the thing said. nice try, little boy. whatever, get your jollies my friends. at least other people started showing up, and i wasn't the only one in costume. i delivered a couple of prints at the show, so i really did have a reason to be there anyway. 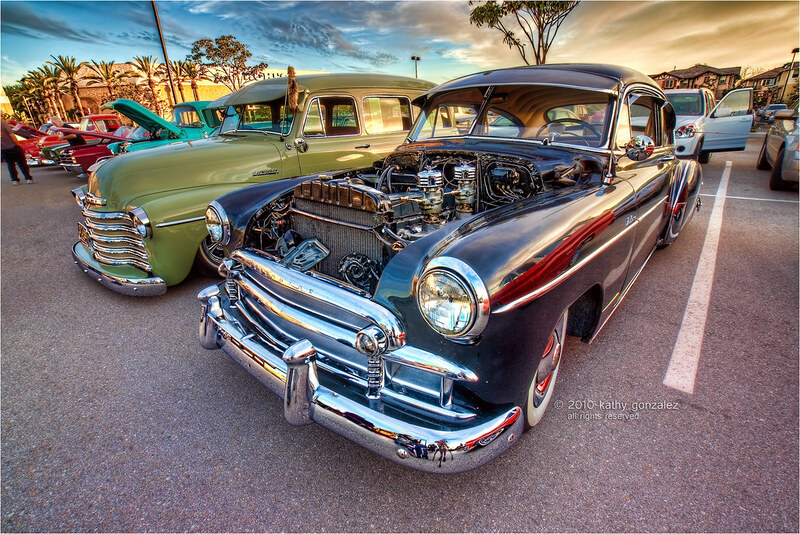 the owner of this black chevy saw one of the prints his friend bought, and i guess he liked what he saw. he asked me to take a picture of his car. here it is...what do you think? there were guys with cameras there, of course, so i suppose a picture of me will pop up somewhere eventually, or maybe i'll post one here after i'm over the trauma. you can always squint real hard at the front bumper and see me behind the tripod, as always.